Hiya guys! It's October 3rd and that means one thing and one thing only... it's the day Aaron Samuels asked what day it is. Yes guys, it's officially Mean Girls day and if you don't know what I'm talking about... like bye. No, but seriously it's one of my favorite movies of all time and you should watch immediately. So to celebrate, today I'm sharing swatches for the October 3rd Mean Girls Duo by Supernatural Lacquer and Bluebird Lacquer. And yes, you better believe I watched the movie for the 100th time while swatching these two. Without further ado get in losers, we're going shopping! Haha. Now let's get to the swatches before I bombard you with more quotes. The October 3rd Mean Girls Duo by Supernatural Lacquer and Bluebird Lacquer will be releasing tonight Tuesday, October 3rd at 7:00 pm EST and available until Sunday, October 8th. This LE duo retails for $22 and will not be sold individually or restocked. Sold only thru www.bluebirdlacquer.com with a TAT of 15 days to allow for maker shipping time to Bluebirds location. Supernatural Lacquer - Is Butter a Carb? Is Butter a Carb? can be described as a creamy silver holo with micro flakies. My photos really don't do the holo any justice, it's very prominent in direct sunlight. But I'm a hermit in a cave so no sunlight for me unfortunately. That aside, this shade is absolutely stunning! I mean what's not to love about a straight silver holo?! It's a must for any collection and this one definitely makes the cut as one of my favorites. The formula has a sheer application, but does build-up evenly for full coverage. Though it's sheer enough to also be worn as a topper over a base. It has smooth and balanced consistency, not too thick or too thin. Shown in three coats and sealed with a glossy topcoat. You Go Glenn Coco can be described as a hot pink linear holo with multi-chrome flakies and holo micro flakies. I was simply blown away by how much I completely love this pink! If you know me, pink is normally not a color on my radar... like not even remotely. But this hue is gorgeous and the flakies give it the perfect touch for some depth. Of course, I especially love the way it looks against my skin-tone. 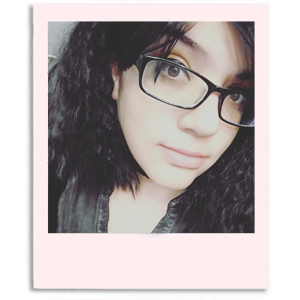 I'm not always able to pull of the color, which is why I don't gravitate towards it. This one though *swoon* definitely a must-have! The formula has a sheer application with great opaque build-up. Consistency wise it's well balanced and has plenty of flakies per brush stroke without overwhelming the finish. Despite all the flakies, this shade does dry down to a smooth high-shine finish on its own. Shown in two to three coats and sealed with a glossy topcoat. Overall this is an absolutely gorgeous and amazing collaboration between these two. No doubt a must-have duo - especially if you're a super fan of these brands like I am. Not only do they look fantastic, but the formulas on each are a dream to work with. Simply so fetch. 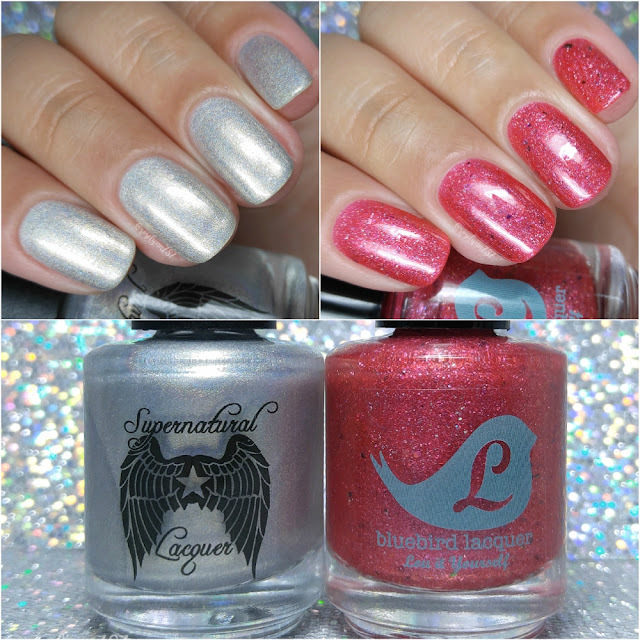 To recap, the October 3rd Mean Girls Duo by Supernatural Lacquer and Bluebird Lacquer will be releasing tonight Tuesday, October 3rd at 7:00 pm EST and available until Sunday, October 8th. This LE duo retails for $22 and will not be sold individually or restocked. Sold only thru www.bluebirdlacquer.com with a TAT of 15 days to allow for maker shipping time to Bluebirds location.